Khartoum: The head of Sudan’s feared National Intelligence and Security Service, Salih Ghosh, has resigned from his post, the country’s new military rulers said on Saturday. “The chief of the transitional military council, Abdel Fattah al-Burhan, has accepted the resignation of… the chief of NISS,” the transitional military council said. Ghosh had overseen a sweeping crackdown led by NISS agents against protesters taking part in four months of mass demonstrations that led up to the toppling of veteran president Omar al-Bashir by the army on Thursday. Thousands of protesters, opposition activists and journalists were arrested in the crackdown that left dozens killed and hundreds wounded. 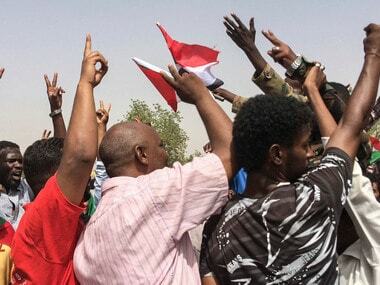 Before Bashir’s ouster, NISS agents made several bids to disperse tens of thousands of protesters who have camped outside the army headquarters in the capital since April 6 demanding Bashir’s ouster. Their efforts proved abortive as troops intervened but police said on Friday that 16 protesters had been killed at the sit-in over the previous two days. Bashir had appointed Salih as NISS chief in February 2018, which was the regime insider’s second stint at the post. His previous stint ended in August 2009. Salih, had worked on and off for NISS ever since the 1989 coup that brought Bashir to power, according to Sudanese media. He was credited with building NISS into one of the most important pillars of Bashir’s regime before his dismissal in 2009.